This post has 9,606 views. Haven’t posted here in a while because I was busy with my studies and life as a grad student is just not that exciting… at least not for me . 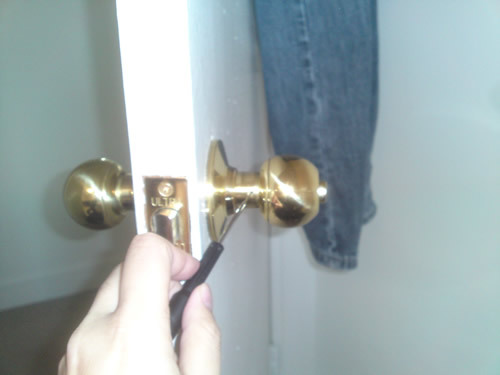 Now that I’m done with the round of midterms, I thought I make a post but I have nothing very interesting to write about, so I might as well make a post about how I replaced a door knob. 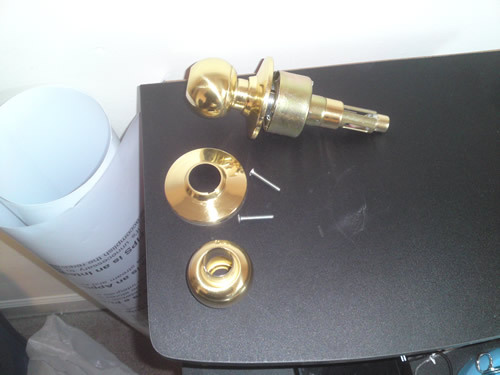 I’m not very handy, but replacing a standard door knob is still within my abilities, and here is the post about the process accompanied by some badly taken photos. The old door knob to my room door didn’t have a keyed entry, and I wanted to have a keyed entry to my door so that I can lock my room while I’m away. The door is the standard 1 3/8 inch thick and the door knob had the standard 2 3/8 inch back set, so all I had to do was go out and buy a regular keyed entry door knob for replacement. I just went to Wal-Mart and bought the least expensive one there is since I didn’t really care how it looks as long as it works. The tools I needed for the process were two Phillips screwdrivers, one of them being very thin and the other being medium sized. Removing the old door knob was a little bit tricky since it had no visible screws, but after doing a bit or research I found instructions on how to replace these knobs. 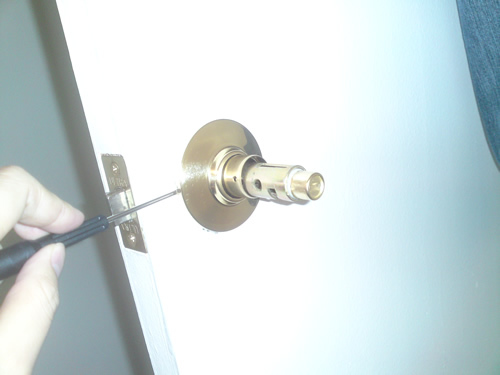 To remove the door knob, you first have to find a little slot on the stem on the interior side of the knob. Once the slot is located, use a thin object (I used a small screw driver) to push into the slot and pull on the interior knob at the same time. The interior knob will come off as shown in the photos below. To remove the interior knob, use a thin object (a small screwdriver) to push into the slot on the stem. The old door knob with the interior knob removed. 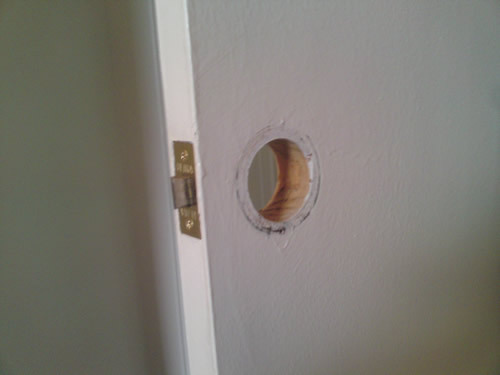 The next step was to remove the rose cover (the round part that’s flush against the door on the interior). For the knob I was replacing, I just had to use a small screw driver to pry it loose because the cover was just clipped on with some wires on the inside. Removing the rose cover reveals two screws and the rose insert, and it’s pretty straight forward after that. After removing the screws, I pulled the door knob out from the exterior side and the rose insert fell out from the interior side. The knob is a bit different than the more (presumably) modern designs that I’ve seen before, but it worked regardless. 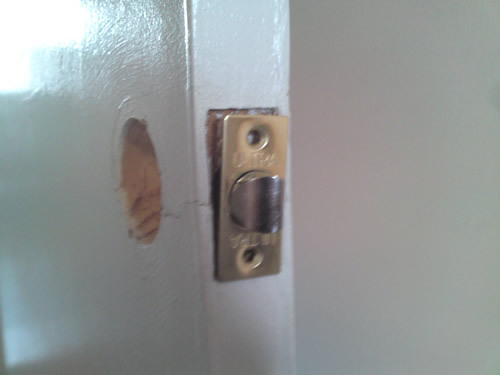 With the door knob removed, I removed the latch and the door was ready for the new door knob. The rose cover to the knob I'm replacing can be pried off with a screwdriver. 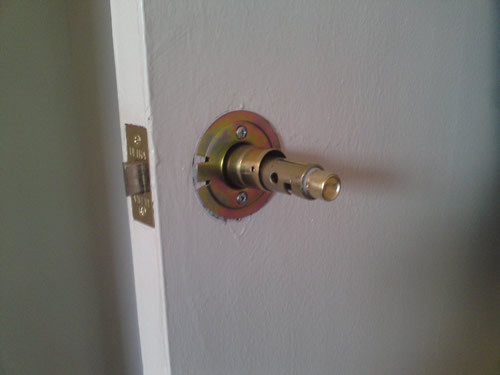 The old door knob after the rose cover was removed. The door with the old knob removed. Only the old latch remains. Parts of the old knob from top to bottom: the exterior knob, the rose cover with the screws, and the interior knob. I forgot to put the rose insert in the picture. 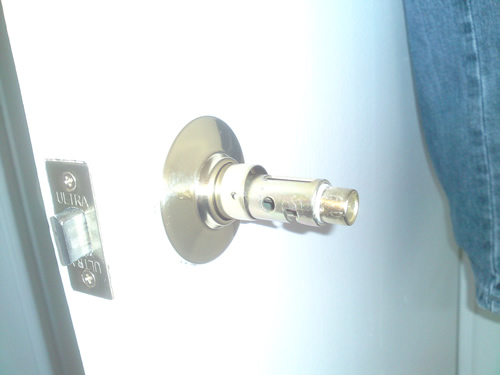 The latch can be taken out by removing the two screws. 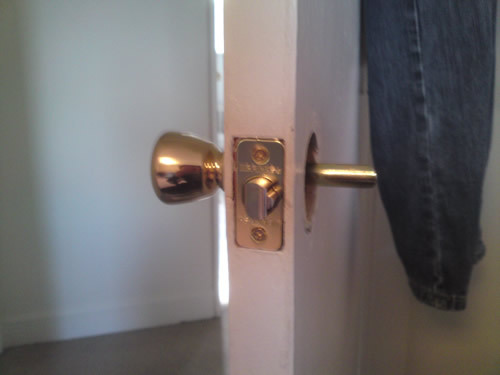 Installing the new door knob was a simpler process as it didn’t have a rose cover or slot on the stem. I just put the latch in, connect the interior and exterior knobs through the latch and put two screws in from the interior side. The new knob fit so well that I didn’t even have to replace the striker plate. After testing out the locking mechanism and the keys, the job was done. 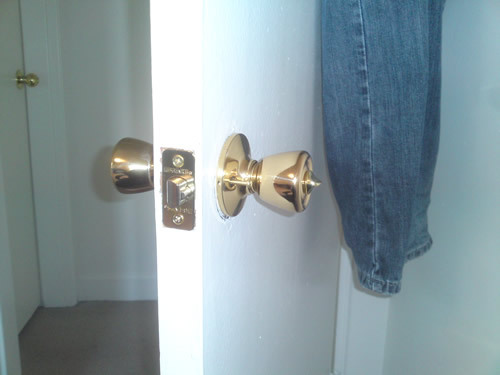 Here is a photo of the new door knob. The new knob, with the latch and exterior portion installed. The new knob, installed and working. As I’ve said in the beginning, I’m far from handy, so it just goes to show that a bit of research helps a long way for these kind of things. As I’m living away from home, I’ll probably have to fix various things from time to time, and I’ll probably have to learn on the job just like this time. Thanks for reading. TJ, thank you so much!!! Your instructions and comments are very easy to follow and your photos are excellent!!! Your encouragement has given me the courage to go ahead and try my doorknob remove/replace!! Sure hope it works out for me!! Please keep up the excellent work!! TJ, just to let you know, by following your excellent instructions, I was able to remove the doorknob in less than 60 seconds!!! Just to let you know, also, that doorknob has been giving me grief since April (5 months of grief!!!) and I had made attempts on several very frustrating occasions to try and remove it with absolutely no success at all!! I was ready to throw the whole door out!! Well wish me luck on installation of new knob!! Glad to hear that it worked out for you. Thanks for the feedback. Hi, it’s me again. Got the new door handle installed. My old striker plate did not work so I had to do some fancy wood-butchering to get the new striker plate installed, now the door is closing, staying closed, locking, unlocking and just in general, behaving like a proper exterior door should. Again, thank-you for your excellent instructions and photographs. Now that the job is done I can breathe a sigh of relief. Hard to believe that we humans actually believe that such a poorly constructed door latch set will actually keep our houses secure. But we don’t realize how pathetically flimsy these door handles are until we take them apart and really find out how they work!! Oh, so that’s how you would replace a door know. Seeing this has me thinking if I can do the same work for installing a deadbolt lock. My plan is to take out the doorknob of the front door of my house and replace it with a new doorknob that comes with a deadbolt lock.